Class sizes are limited. Sign up today! You will get a response that your enrollment has been received with further instruction for registration. Students must email/fax or bring in their vaccination records prior starting class. Any student that has not provided proof of vaccinations will not be accepted in class until this has been provided and approved. Please arrive before 6:00PM if you bring your records and/or pay at the first training session. Please arrive 15 minutes before the class starts. This will help your dog settle and be ready to learn when we start class. Please silence all cell phones during class. Come prepared to have fun and bond with your dog! 1. Please be courteous of your classmates and instructor and be on time. Arriving 15 minutes before class is recommended. This gives your dog time to get settled in and to relieve themselves before class. 2. Please ask before you pet or let your dog meet any other dogs in class. If there is time we can do some socialization, but just because your dog in friendly other may not be and that's what they are here to work on. 3. All puppies must be 5 months of age and had their 3rd round of vaccinations prior to class. DHPP - MUST BE ADMINISTERED BY A VETERINARIAN, NOT AN OWNER and given at 16 weeks of age or older. If the dog received vaccines as a puppy and again at 1 year of age then it can be administered every 3 years. If it received the first DHPP as an adult it must have received one a year later then every 3 years. Rabies vaccine- valid if given after 12 weeks of age in a puppy. If received as a puppy then again at 1 year of age it can be administered every 2 years if labeled as a 2 or 3 year rabies. If the first rabies was given as an adult it must have received one a year later than every 2 years. 6. Wear comfortable clothing and nonskid shoes. Flip flops, sandals and heels are not recommended. 7. Please silence all cell phones during class. 8. Please come prepared to class with your supplies or be prepared to purchase supplies from the Humane Society's Retail selection with at 15% off student discount! 9. 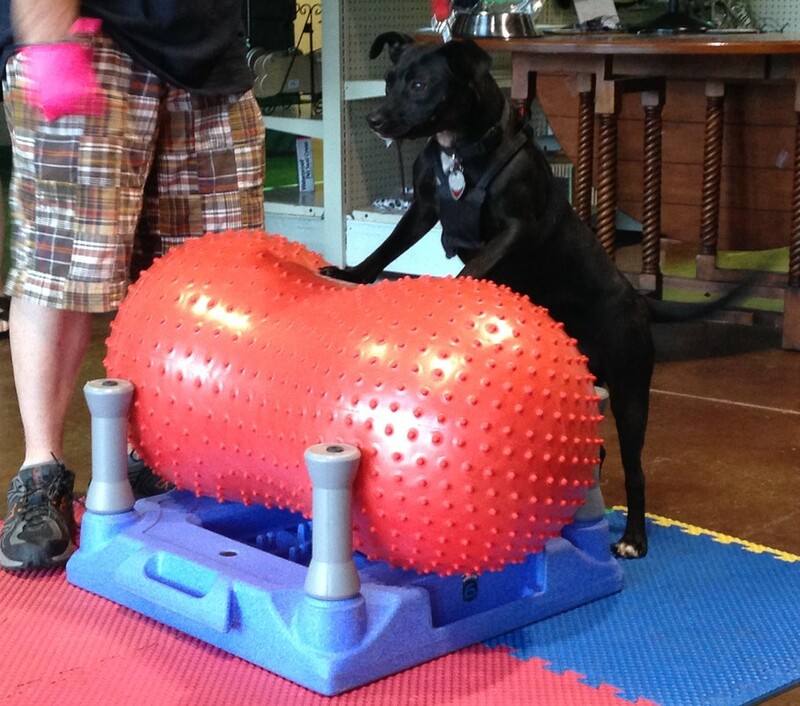 Use positive reinforcement with your dog, keep a positive attitude during the class! 10. Have fun & get to know your dog! As a bonus, all our proceeds go directly back to helping homeless pets at the Humane Society of SW MO find loving new families. Classes are limited to ten dogs each. The small class size ensures an environment conducive to learning. Must have 3 students enrolled in the class or the class will be rescheduled. Training principles are based on force-free positive reward-based training. 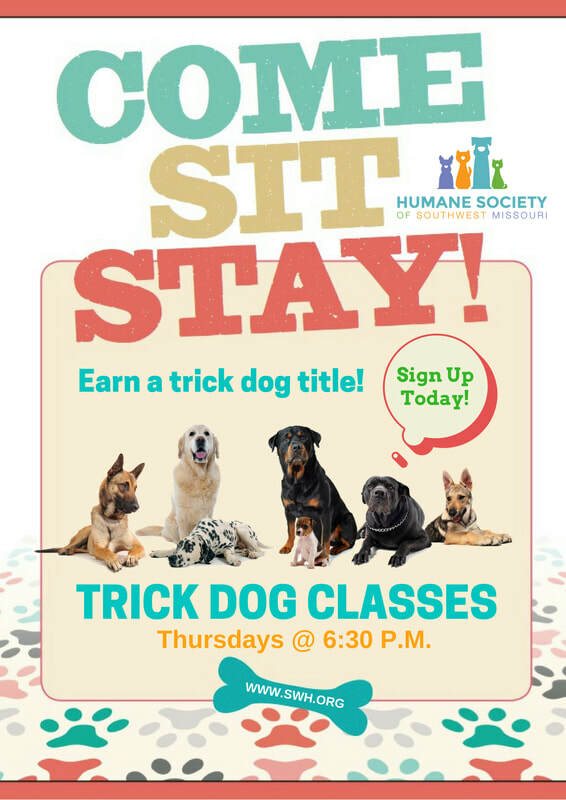 All dogs at the end of the class can earn a trick dog title. Can I bring my family to training class? Families are encouraged to join their dog in training class. Please feel free to bring your spouse or older kids, however space is limited. We want to equip everyone in the home with the right tools you need to train your dog. If I have to miss a class, will I be able to reschedule? If you have to miss a class, please let the instructor know prior to class and we will plan a time to make up the material you missed. If my dog is in heat can I still come to class? If your dog is in heat or sick please don't bring them to class. My dog has reactivity issues to people and/or other dogs. Can I enroll in this class? Dogs with reactivity issues to people or other dogs are welcome. You will need to inform the instructor of your dog's issues before the first night of class so we can make proper arrangements . Where can I register for the class? You can submit a registration request online (see the above form) or fill out a registration request at the Humane Society of Southwest Missouri. All currently enrolled students can purchase supplies at the Humane Society & receive 15% off! Chew toy or stuffed Kong: Toys will be used for reward and during down times. Poo Bags: Be kind and clean up after your pet please. Dog identification tags: If you come with a dog, lets make sure you go home with a dog... or two! We do have dogs here for adoption you know!